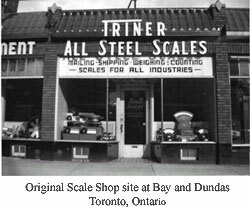 Scale Shop has been in business for over 75 years. In 1985, it was incorporated and advanced into a new era of Electronic Scale Control Systems and Food Processing Equipment. We supply Equipment and Service to such idustries as Fishing, Mining, Construction, Offshore Oil, Government, Pharmeceutical, Forestry , Lumber, Supermarkets and Butchers as well as Bakeries. The company originally opened its doors for business under the ownership of George Montague on Bay and Dundas Street in Toronto, Ontario. After being commissioned by the Newfoundland Government in the early 1940’s to perform work on various scales, Mr. Montague decided to move his business to Newfoundland because it reminded him of his own home country of Scotland. He ran a very successful company until his death in 1985 .The company today operates under the ownership of Mr. Wayne White. The company was incorporated in February, 1985 and continued to focus on a new era of Electronic Weighing and Control Systems. Since Mr. White had years of previous experience in Food Equipment, The Scale Shop Ltd. developed a second division of Food Equipment Sales and Services. Since that time the company has evolved in becoming the largest Scale and Food Equipment company in Newfoundland and Labrador with nine employees.In July of 2006 Mr. White assumed full ownership of the company and has recently expanded it's product line to include Packaging and labeling Equipment, Weighing and Portion Control Systems and Consumables. Scale Shop supply sales and service to over 3500 customers across Newfoundland and Labrador in such industries as Fishery, Mining, Construction, Government, Offshore Oil, Supermarket , Food Processing , Bakery, Forestry & Laboratories. Today the company operates out of it's new 10,000 square foot building in Donovans Industrial Park and represents over 50 different Manufacturers of Food Equipment, Weigh Scales and Accessories from all over the world and is quickly growing every year. The Company are also manufacturers of Customized Weighing and Dump Systems for the Fishing and Food Industries, Shrimp and Crab Processing Systems ,Data Collection and Grading Systems , Concrete and Aggrigate Weighing and Batching .